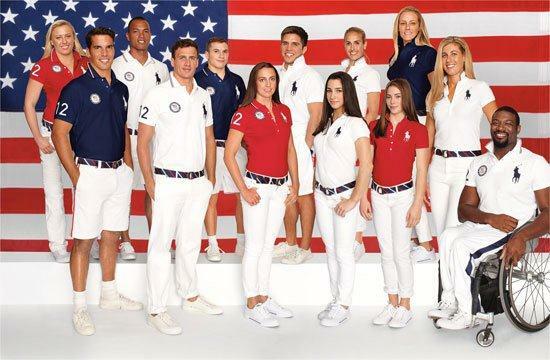 With only an hour until the official Opening Ceremonies for the 2012 Summer Olympics in London begin -- which I will watch televised later this evening – it is apparent that American pride is beginning to swell. Personally, I am excited to watch all of the different 46 sporting events; with running, beach volleyball, gymnastics and swimming segments being at the top of my list. However, since I am one fashion obsessed girl, I am also looking forward to checking out all the noteworthy fashions that will be on display. Usually, when you hear the names Ralph Lauren, Stella McCartney, Giorgio Armani, Prada, Hermés and Salvatore Ferragamo you think of fashion week. But not in this instance, they are the designer names who are dressing the talented athletes of the world for success. It isn’t shocking that McCartney would be the ideal choice for Great Britain to lock down to dress the Brits as she has been designing for Addidas since 2004. Yet I believe McCartney inspired the gamut of other designers to join in on the fun. Team USA will wear uniforms created by Ralph Lauren, whose designs have always been the epitome of classic America fashion. Lauren’s Olympic Collection includes fleece warm-ups, USA appliques and track suits. Puma has teamed up with Bob Marley’s daughter, Cedella, to design some trendy duds which will include the colors of the Jamaican flag. Yeah, mon! I agree that having an American manufacturer create the uniforms would be the most patriotic thing to do but, it is really about the games and not the duds, so I move on people. For me, the focus on sports fashion at this year’s games certainly intrigues me, but I cannot wait to watch the extraordinary actions of athletes from across the globe as they compete for the Gold, Silver and Bronze in fashionable attire.